This collection of essays analyses the impact of globalisation on public-sector reforms. It's basically a collection of some papers presented at an international conference on administrative reforms, organised by the Centre of Law and Governance, Jawaharlal Nehru University, New Delhi. Reforms in urban governance, e-governance, power, transport, disaster management, health and environment are some of the concern of the contributors. All, except one paper on local government innovations in us cities, deal with administrative reforms in India. In her introduction to the volume, Amita Singh attempts an overview of the history of administrative reforms in the country. But this is preceded by pedantic details on academic works on the subject. The uninitiated reader, of course, needs to be guided. But the extensive reading list at the end of the chapter does this job much better. The author is, however, much more succinct in her historical survey of administrative reforms in India from colonial times to the post-globalisation administrative changes in India. The first section of the volume deals with urban local governance and has papers by Mohit Bhattacharya, Jeniffer Jalal and Vidu Soni. Bhattacharya focuses on large-scale urban management reforms in Kolkata Municipal Corporation , one of the largest municipalities in the country. This was attempted by establishing borough and ward committees, but there was limited success. The committees were too dependent on the Union government, and had inadequate operational autonomy in selection and execution of schemes. Bhattacharya therefore stresses that reforms in local government institutions can only be successful, if they are accompanied by comprehensive decentralisation. Jenniffer Jalal's article also focuses on Kolkata. Comparing the city with Bangalore, Jalal notes that while the former could not get away from its tradition of bureaucratic, centralised governance, the latter has been able to produce a significant impact through the initiatives of enlightened bureaucrats and non-governmental organisations. Vidu Soni's article, "Local government innovations in American cities" collates case studies of urban local governance from a few us cities. Soni suggests a mix of institutional reforms and investment in human capital as a prelude to sustainability. The book's second part deals with power and transport sector reforms. In his study of power sector regulations in India, Daljit Singh suggests that independent regulation can only work in the power sector if the government refrains from interfering in the operation of regulated entities. Sudha Mahalingam takes a somewhat different approach: she asserts that in absence of the basic reforms and establishment of stable governance structures, efficient practices in the power sector would be of limited value. Kuldip Mathur's in his article, "Battling for clean environment" looks at how the country's political leadership, environmentalists, technocrats and the courts have dealt with issues related to pollution. He notes that in areas related to the environment, the government finds it quite convenient when the courts intervene to find solutions to social conflicts. Social sector reforms The third part deals with social sector reforms. Saibal Gupta's study of the National Literacy Mission (nlm) examines how factors such as political will and community participation are important for the mission. Gupta's analysis of the Zila Saksharta Samitis in Bihar indicates the need for local area action, instead of national missions. He also contrasts Bihar's experience with that of Kerala. The latter's rich social capital made its literacy campaign a model for other states, while in Bihar, nlm floundered because the state lacked worthwhile ngo s and social capital. Gupta's is the only piece on education reforms. One hopes that the volume had touched on issues related to reforms in educational institutions: curricula, privatisation, and teachers' accountability. James Warner Bjorkman takes issues related to privatisation of the health sector; the author asserts that some basic capacities need to be developed before the health sector is privatised. Bjorkman makes a forceful argument for equity in access to health amenities. 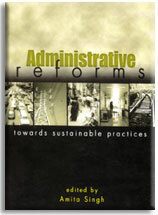 The diverse case studies in this volume will make it good reference material for anyone interested in administrative reforms.